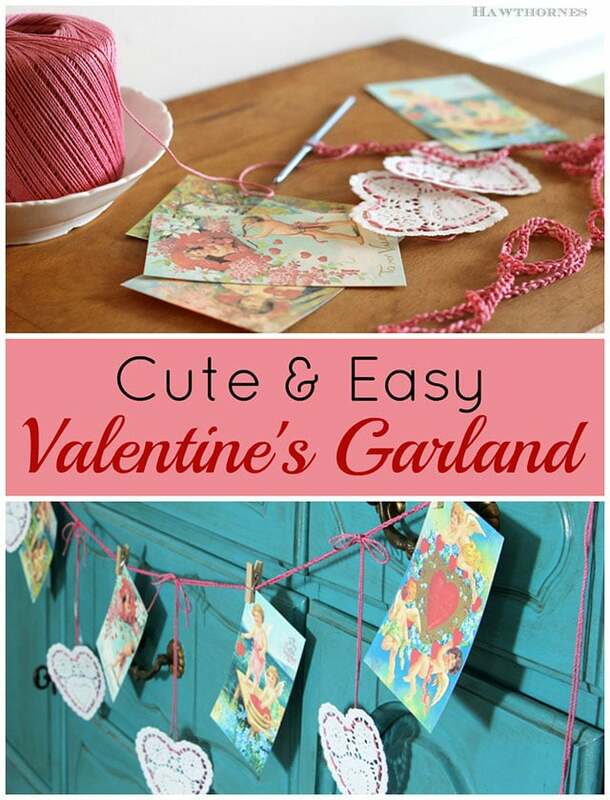 I have a love affair with those little heart shaped paper doilies you can find at the dollar stores. They’re so inexpensive and just shout ROMANTIC DECOR to me. 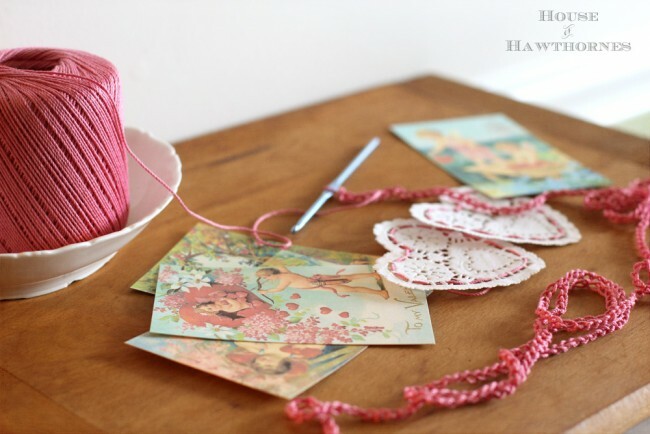 So this year I decide to make a romantic handmade Valentine’s Day garland with them. And the emphasis on this project has to be how EASY it is! I tend to gravitate toward crafts that can be made in an hour or two. Much longer than that and it will sit unfinished until I finally throw it away two years later. Really. I’m just about to give up on a sheet music wreath that I started prior to Christmas in 2011. I printed out some vintage Valentine images that I found on The Graphic Fairy‘s site. She’s got tons of vintage Valentine images to choose from. Love that girl! And I used mini clothespins that I bought at Walmart to attach them to my hand crocheted string. You can just use a plain piece of string, but I wanted it a little thicker, so hence the crocheted chain. 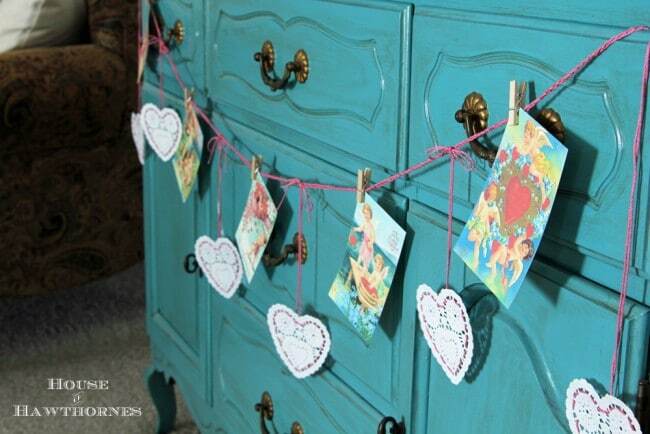 Embroidered paper heart doilies were hung between the vintage images. I bought the plain paper hearts from the local dollar store and “embroidered” around them with crochet thread. They have the paper heart doilies all over the place this time of year for right around $1 a pack. I displayed it on my turquoise dresser. Voila. Done in record speed and cute to boot. This is something I think I can do. Thank you for the info. 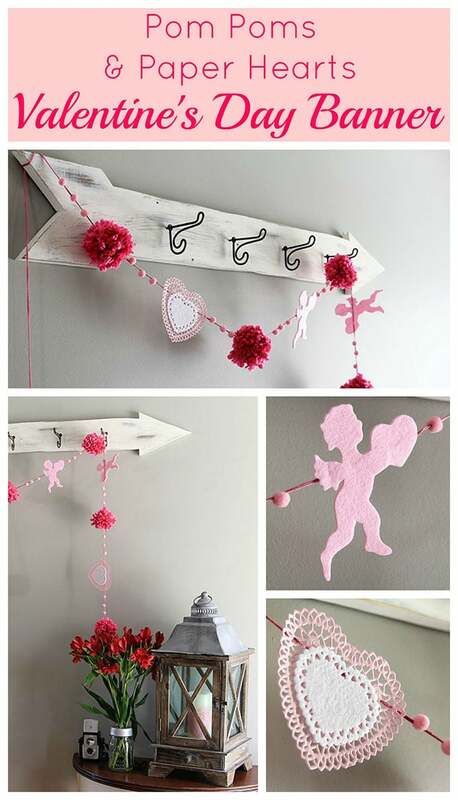 on how to make this cute garland. Unfinished craft projects?! Don’t even go there! I’m trying to stick to smaller projects myself, since I have so many big home projects hanging over my head. Sometimes projects don’t have to be hard to be cute. I like the garland, Pam. I like easy projects, they’re the best kind!! Very cute!! Fabulous garland. I especially love it against your turquoise dresser. Nicely done, Pam. Cute, Pam! And, it’s a quickie! Now you’re ready to party! so pretty! and so simple thanks for sharing..
Oh that is cute! I might try your garland. I will have to use ribbon because I don’t know how to crochet, but the rest looks easy and pretty. Very good inspiration. 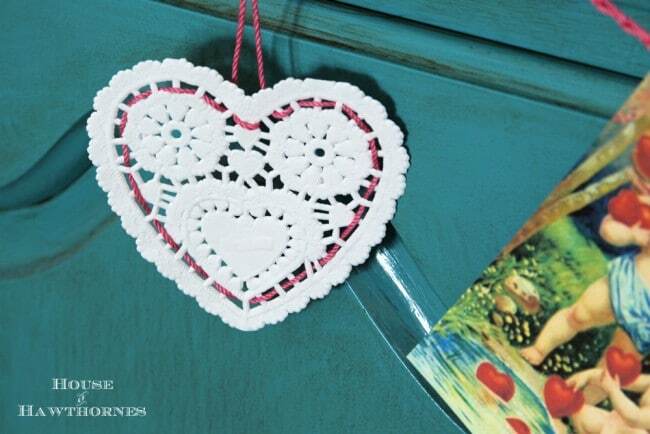 I love paper heart doilies. Thanks for the great tip! Love the blue cabinet the garland is displayed on! I love this project! 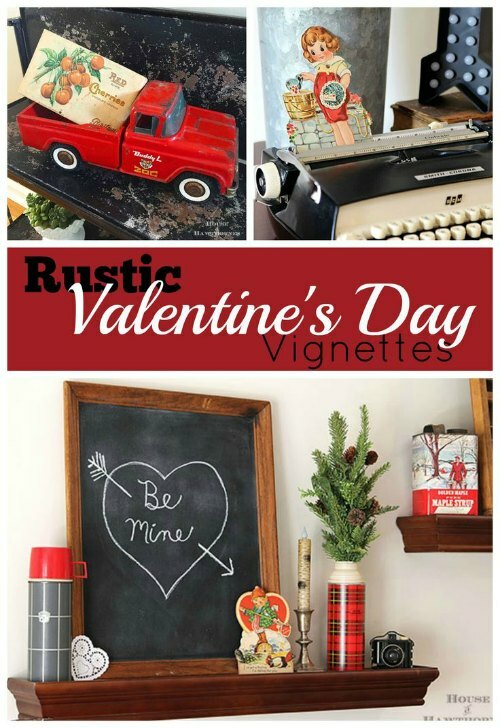 Vintage style valentines are always a hit with me. Oh and I’m in firmly in the “reproduce project” camp. Original idea’s do not come from me. LOL. Pam, this turned out so cute!!! This is so charming, Pam! And I really love the embroidered heart idea! Love this by the way! You’re one crafty lady Pam! Very cute. I really like that dresser! 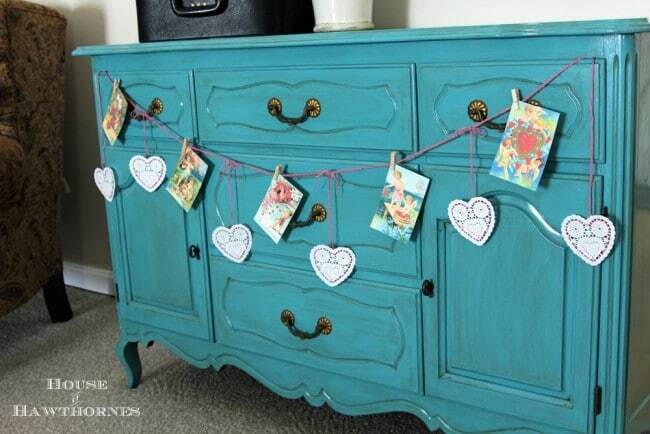 Love your garland and cabinet. 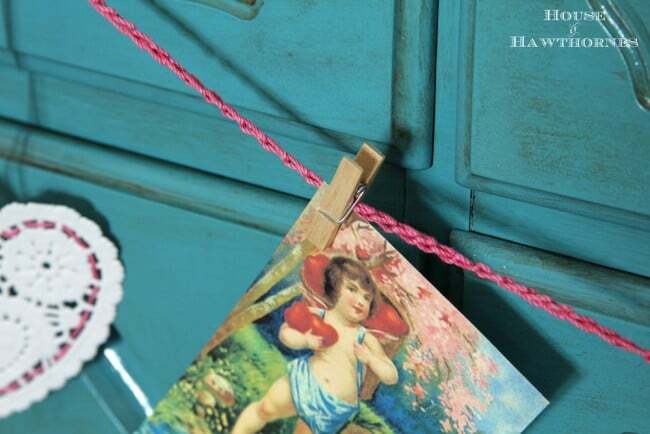 So cheerful – and such unique things to hang! Absolutely LOVE this garland, Pam! And I love YOUR love of vintage images too! 🙂 Pinning! 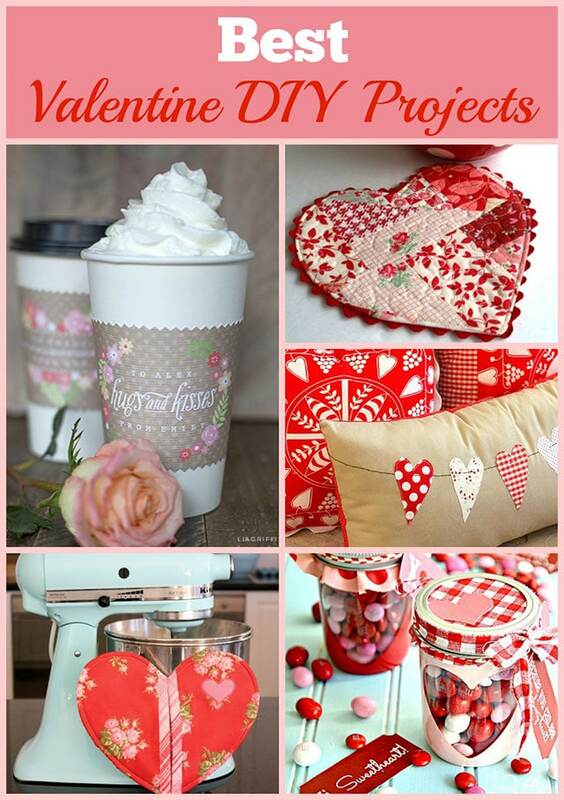 Karen over at the Graphics Fairy sent out an email today with a round up of all kinds of great Valentine’s crafts. Guess what? 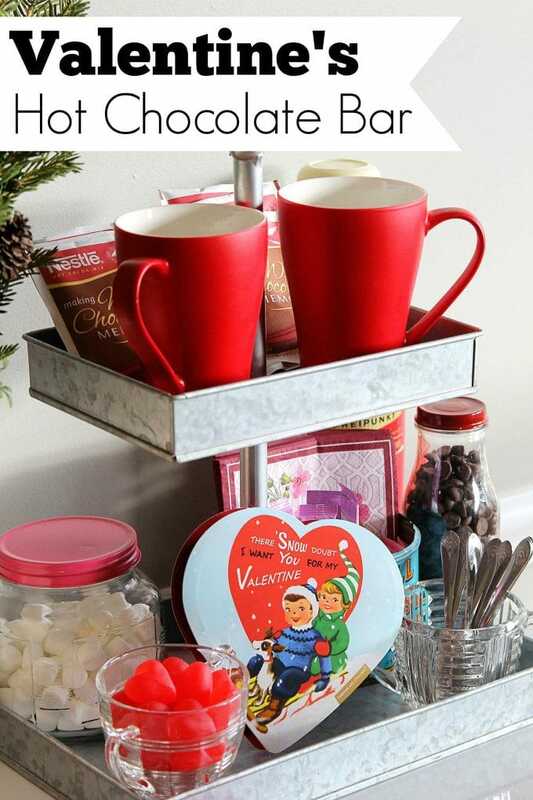 Your garland is included!! Yay!! Um, the “yay” is for me ’cause I found you courtesy of that email and I’m not letting go! And consider me a stalker-by-newsletter since I signed up for the newsletter and will definitely have to be checkin’ out the goins’ on around your blog. Yep. I’ll be watching. And enjoyin’! Can’t wait to dig into your site. BTW…I’ll soon be blogging myself. I’ll no doubt want to reach out to you from time to time. Your style, and your attention span, are very similar to mine! Yay!!! I hadn’t seen that! And I get her emails daily 🙂 Glad to have you on board. Stalk away! Let me know when you get your blog up and running and I’ll stop on over!